Onam is a Hindu festival celebrated by the people of Kerala, India and observed by Malayali Hindus. The Onam festival falls during the month of Chingam (August–September) and lasts for ten days. 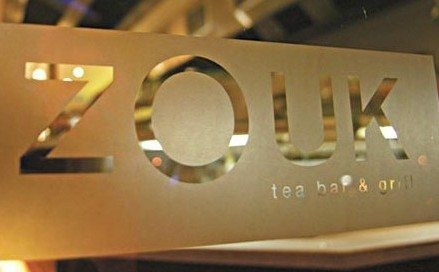 This year the festival falls on 29th August. Vishnu is one of five popular Hindu gods. It is his fifth avatar, Vamana (a descendant of god as human form) that is celebrated during Onam. The ancient festival has many elements including the Kerala rice harvest festival and the Festival of Rain Flowers which commemorates the return home of the legendary Emperor Mahabali – a power-seeking King in Indian mythology. Mahabali’s rule is considered the golden era of Kerala but in recent times Onam has become a national festival for the people of Kerala. The tales goes that Mahabali was such a well liked King that other Gods including Indra became jealous and complained to the God Vishnu that Mahabali was almost an Indra equivalent. Vishnu agreed that there could not be two Indra and turned himself into a dwarf, Vamana. He requested three pieces of land from King Mahabali and enlarged himself to be able to travel between the three worlds; heaven, Earth and the netherworld. Unable to meet this request, Mahabali offers his head as the third step and in this way Vamana places his foot on King Mahabali’s head and sends him down to the netherworld. However, as Mahabali was equivalent to Indra, with the grace of Vishnu, Mahabali visited his people on an annual basis, Onam. During the ten-day Oman festival the people of Kerala want to show their King that they are happy and are thankful for his sacrifice. They wear their new clothes and visit temples. Different traditions are marked on each day of the Oman festival, making up a full calendar of activities throughout the ten-day celebration. 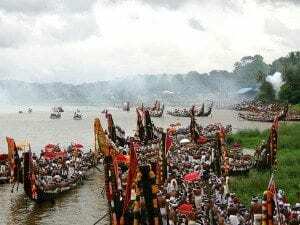 These include Vallamkali, a Snake Boat Race, held on the Pamba River. Hundreds of boatmen race elaborately decorated boats, whilst spectators and viewers chant songs and cheer. 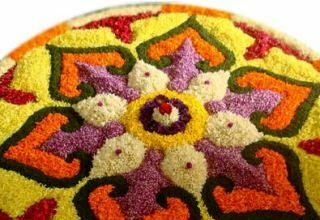 Other sports are played throughout the Onam festival period and the women take part in crafts and their is a competition to weave the most intricate floor mat, known as pookalam to welcome King Mahabali. They also perform two traditional dances and other folk performances. A central feature of the Onam festival is the grand nine-course feast called Onasadya where the food is served on banana leaves and people sit on the newly made floor mats to enjoy their meal. 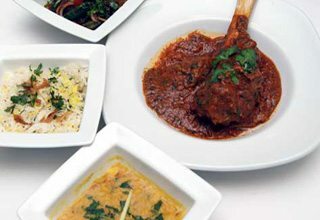 Dishes include rice, traditional Indian savouries, pickles and poppadom’s. A traditional sweet and milky dessert called ‘payasam’, is usually served. Are you celebrating Onam today? Let us know how you are marking the festival – why not Tweet us your pictures or share them with us on our Facebook page? Chocolate Curry Cupcakes recipe for Valentine’s Day!